Finding creative ways to derive enjoyment—and a little extra income—from non-timber forest products. Many forest owners enjoy the pleasures and profits that Non-Timber Forest Products (NTFPs) bring. Broadly speaking, NTFPs are forest products or services aside from commercially harvested timber that have potential personal or commercial value. NTFPs range from foraged berries and mushrooms to holiday wreaths and essential oils, from firewood to agricultural soil amendments, and on and on. Sometimes commercial services like tourism are considered NTFPs. Two members of NNRG’s FSC® Group Certificate are capitalizing on some of the NTFPs in their forests. We hope their experiences inspire some curiosity in other landowners about the NTFPs in their forests. 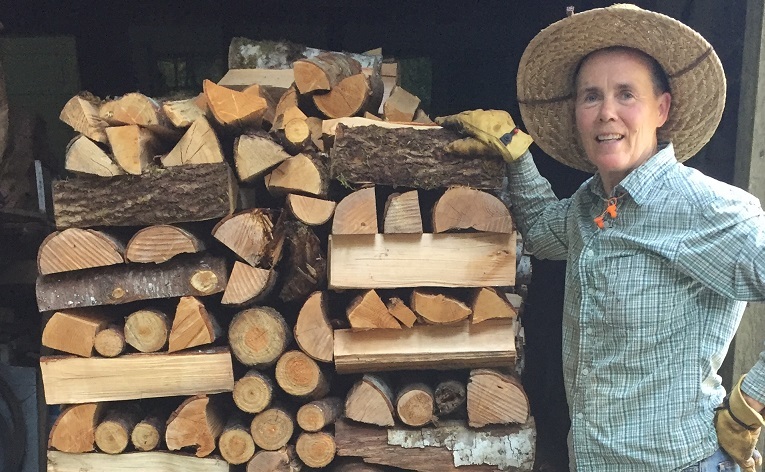 Lynn handles all of the firewood orders. Right now, about 20 grocery and hardware stores are stocking their bundles. Their vendors include New Seasons, Green Zebra, Gaston Market, and some Ace Hardware stores. 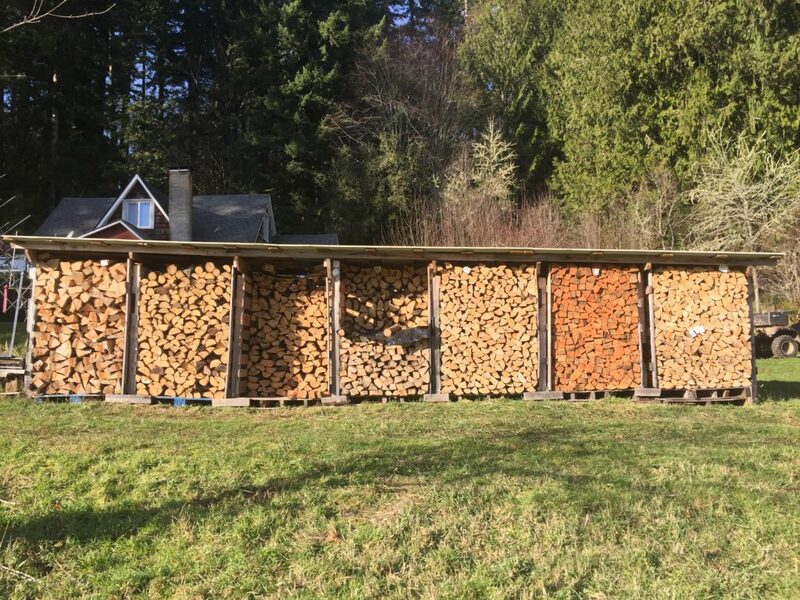 8.5% of the wholesale price of the firewood goes to the co-op for management and marketing, and the rest is passed on to the farmer. The regular bundle retails for about $7. A full list of stores carrying Eve and Lynn’s firewood is available here. Eve & Lynn also sell chiminea firewood, available through Little Baja. Other products sold through Oregon Woodland Co-op include evergreen boughs, Canopy Essential Oils (created by another NNRG member, Jim Merzenich of Oak Basin Tree Farm), and Oregon Heartwood. David Chuljian began tapping bigleaf maples in 2014. He’ll be the first one to tell you: bigleaf maple syrup isn’t really a commercially viable NTFP. Most of the (authentic) maple syrup available in grocery stores comes from sugar maples (Acer saccharum). True to their name, sugar maples have high concentrations of sugar in their sap. In contrast, bigleaf maples are less sweet. 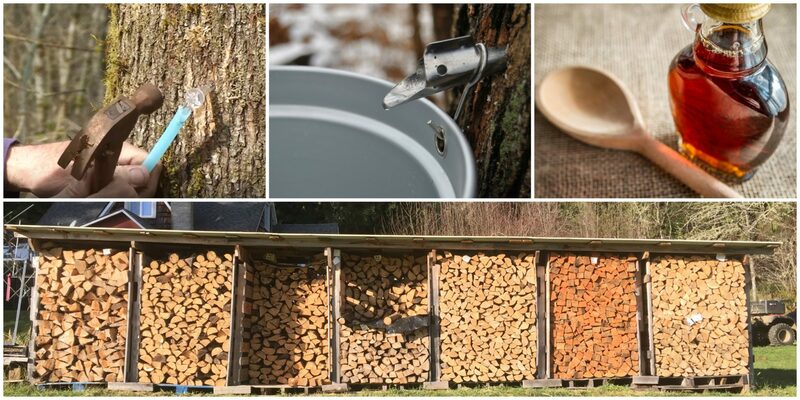 It takes around 50-75 gallons of bigleaf maple sap to produce one gallon of syrup (compared to 30-45 gallons of sugar maple sap to make one gallon of syrup). But David isn’t interested in selling his syrup. It’s more of a hobby—and a tricky one at that. 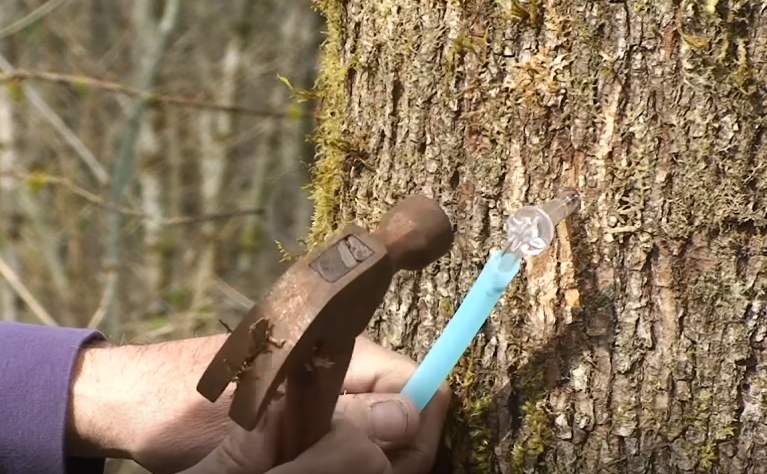 Figuring out which of his trees produce the most sap has taken years. “Some trees produce…and some don’t,” he says, and after a while you start to figure out which are which. Tapping is done in the winter—but even the timing is a little mysterious. Usually David starts tapping in early December and wraps up in February. This season the window was much smaller: the sap flow didn’t start flowing heavily until just after the big snowfall. Since then David has harvested 100 gallons (compared to about 200 gallons last year). Now, it’s already too warm again for the trees to produce much. 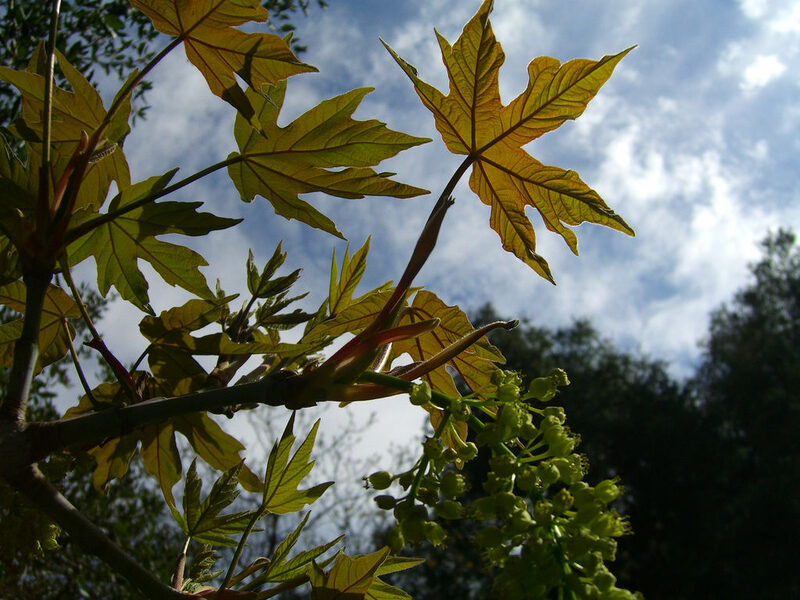 Bigleaf maple (Acer macrophyllum) agains the sky. 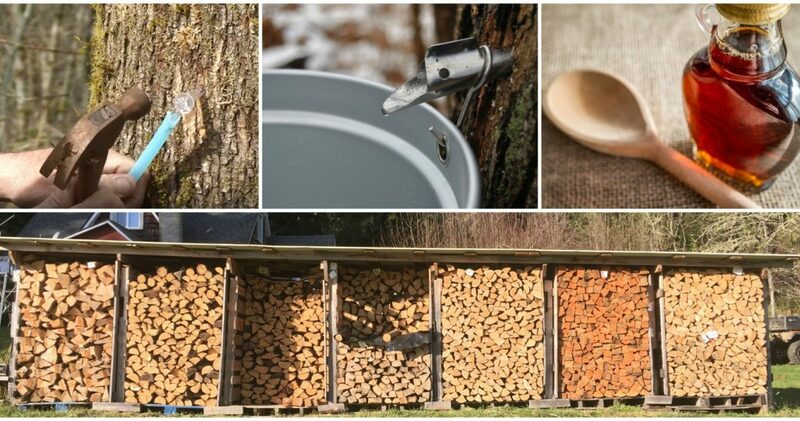 Once collected, the sap is cooked down for a long time—David boils it on an outdoor stove overnight—until it’s been significantly reduced to a much thicker, more sugary substance. That substance is then filtered (methods vary) and voila! You’re left with homegrown bigleaf maple syrup.